The An-124 strategic airlifter, Nato code name Condor, first flew on December 26, 1982 with Vladimir Terski at the controls, and at least nine had been built by June 1987. 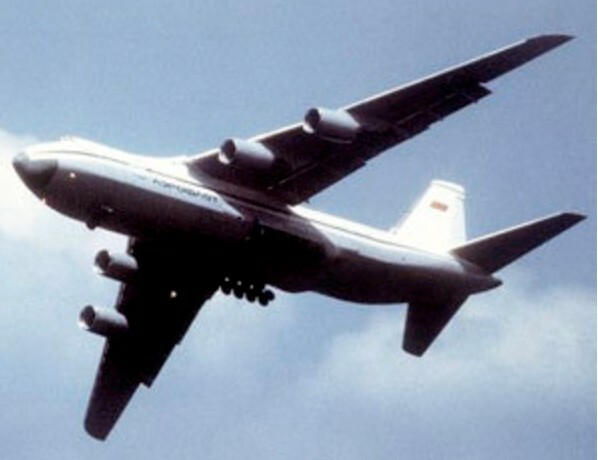 At the time of its first flight, the An-124 was the largest aircraft in the world. The An-124 is powered by four 230kN-thrust Lotarev D-18T high-bypass turbofans, and is claimed to carry its 150-tonne maximum payload over 4,500km. Designed for simultaneous nose and tail loading, with a visor-type lifting nose and integral forward-folding ramp, the pressurised cargo hold is 36m long, 6.4m wide, and 4.4m high. A pressurised upper deck can accommodate 88 passengers. The An-124 has a six-man crew (two pilots, two engineers, a navigator and a radio operator), dual weather and ground mapping raders, quadruplex inertial navigation, and anologue fly-by-wire controls with mechanical backup operating hydraulic control servos. Two overhead travelling cranes, which have a lifting capacity of 30 tonnes, and two winches allow heavy cargo to be self-loaded without the use of special airport loading equipment. To enable the carriage of extremely heavy cargo, HeavyLift-Volga-Dnepr have developed special loading systems allowing individual items of up to 100 tonnes to be loaded. In addition, two double-deck car-racking systems have been built allowing up to 50 cars to be carried in one flight. Approximately 5,500kg of composite materials are used in doors, fairings, and panels, including 3,000kg of carbonfibre, giving a 1,800kg overall weight saving. The second aircraft, named Ruslan, appeared at the 1985 Paris Air Salon. The aircraft entered service with Aeroflot in early 1986, and now serves principally on the Siberian run, carrying outsize items to the oil and mineral exploitation industries. In 1987 the An-124 began service with the air force. Production is reportedly eight to ten aircraft per year, and by 1989 over 25 had been completed. The An-124 was assigned the NATO reporting name 'Condor'. The An-124-100 is a civil varient, certified in Russia. They are built one at a time and take about three and a half years to construct. Its 24-wheel undercarriage allow it to go into semi-prepared strips and the two nose-wheel units can be retracted on the ground allowing the aircraft to 'kneel' to assist loading. The large undercarriage system, the full-span, leading-edge slats and flaps give the An-124 very good short field performance. Full-span leading-edge slats and large flaps give the An-124 short field capability, while its 20 main wheels allow the type to use rough fields. Civil examples were with Antonov Air Foyle, HeavyLift Volga Dnepr and the Russian-Australian joint venture, Antonov Airlines.